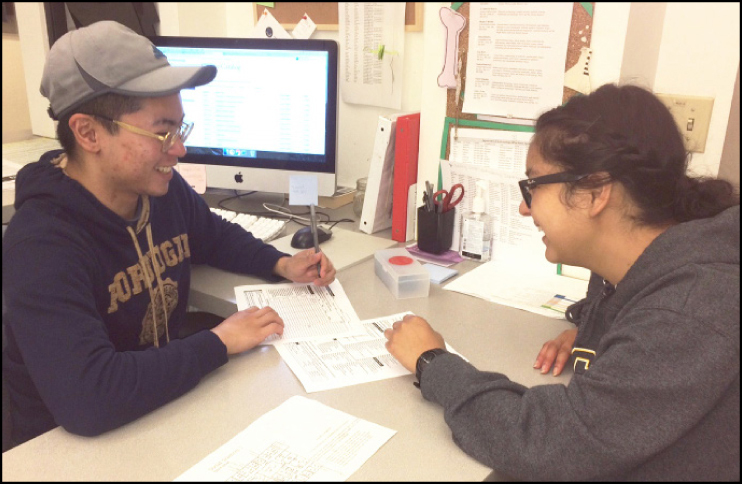 Brian Palma, a returning peer adviser, and Laura Rodriguez, a first-time peer adviser in spring 2018, work together on an academic plan. Peer advisers work in the department office, answering questions and providing guidance. Anthropology Peer Advisers are Junior and Senior Anthropology majors who have been trained to answer students’ questions and provide guidance about the major and minor. Peer advisers also collaborate on group projects to provide resources for the department. Here they reflect on what they learned about collaboration through the program. Laura Rodriguez: Previously, working in group assignments has not always been my strongest suit, but I can with all honesty say that my experience working with peer advisers was a fun one. The two people I collaborated with the most with, Emily and Brian, were both very patient in guiding me and showing me around, but overall, they changed my perspective on group projects. They showed me that projects do not have to be exasperating, they can actually be fun. Emily N. Truong: Having advisors with different interests and backgrounds makes helping students easier and more engaging because we were better able to make recommendations for classes and professors according to our own experiences. Brian Palma: Peer advising allowed me to feel immersed in the anthropology major and to feel a sense of community. Because of my experience peer advising last quarter, I have managed to befriend people that I helped advise (and even attend classes together that I’ve recommended to them). Kendyl Domingo: The professors, TAs, and fellow classmates have made the anthropology major enjoyable, interesting and something worth pursuing. This department, in general, has made me feel a part of a community. Furthermore, being a peer adviser really helped me be more comfortable talking to students and faculty. I am glad I took the opportunity and got to know the department more before I graduate. Sofia Vermeulen: The greatest sense of community I’ve gotten from the anthropology department was during my time as a peer advisor, where I got closely affiliated with both students and faculty. Sophia Grace O’Meara: Helping other students with different passions and interests in the subfields of anthropology really helped me learn about how broad the field really is and how people can have completely different experiences within the same major.